Wednesday’s mean a new sketch at Freshly Made Sketches and this week I’m the sketch hostess! Here’s the sketch I’ve designed for this challenge. I wanted to try something different by stamping a sentiment around my circle. Stampin’ Up! has introduced photopolymer stamps this year in Australia and I find they’re perfect for curving when placed onto the clear block. The sentiment I’ve curved and trees are from Festival of Trees stamp set. The “Merry Christmas” sentiment is from Petite Pairs and the designer series papers are from Under the Tree Specialty Designer Series Paper. 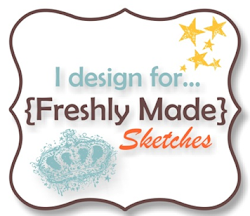 We would love for you to join us this week at Freshly Made Sketches. Head over to the challenge and have a look at the fabulous inspiration from the Design Team – you’re going to love their cards as much as I do. That’s a great idea to curve the stamping around the outside of the circle.Great Christmas card Narelle!!! Wonderful sketch Narelle and you rocked it! Love your stamping around the circle! Beautifully frames the trees! Beautiful card! Okay this is amazing! Curving your stamps?! You’re so creative! Love the colours and the trees! Perfect for Christmas! Great sketch – though I must admit it challenged me!!!! Wow, curving the sentiment is such a cool look! 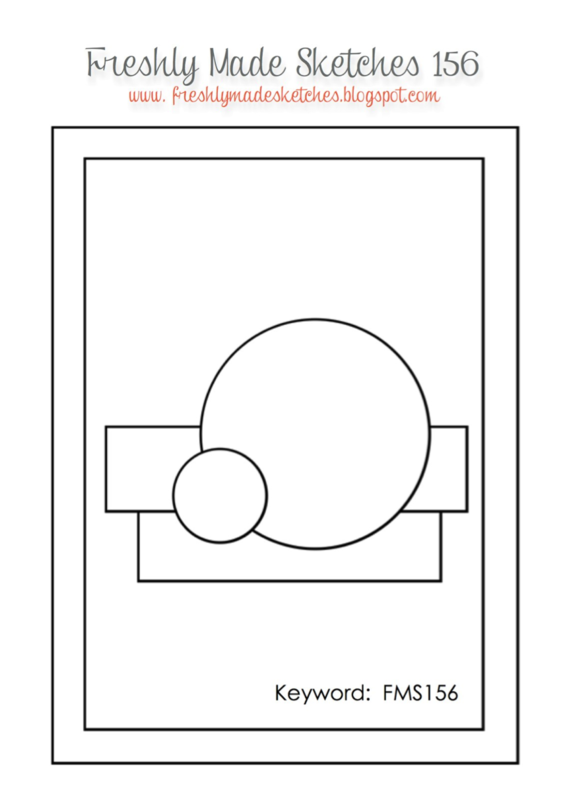 It’s perfect for your beautiful sketch! I love how you’ve stamped around the circle. And I love all of the elements on this card. And I have to say that I absolutely love this sketch! This is such a cool sketch and the DT sure showed how versatile it is! And what a good job you did curving that sentiment – that would have taken me about 2,392 attempts 🙂 Fabulous card! Love this Christmas card – lovely colours and great sketch. What a peaceful, serene card for Christmas! Love the trees and the arched sentiment with your sketch. Thanks so much for the inspiration! Your sketch is awesome and so is your card!! Awesome colors and i love how you curved the sentiment!! Aren’t you smart with the curvy sentiment! Another thing to add to my to-do list!! Fabulous sketch and a fabulous sample! Thanks for the inspiration! I am so happy to find your nicee project! I will copy your idea with the curving text!! Its such a great idea!!! TFS!! !